So, I’m in charge of night-time chores for the next ten days. Well, nine days, because I completed last night’s tasks successfully already. I remembered to shut the chicken door at sunset! Actually, I showed up a little early. The hens were just thinking about heading in for the night. It’s quite a process that they go through every night. I haven’t noticed if there is a lead decision maker or not, but as a general rule, the group shows little hesitation about gladly following somebody’s example. As dusk begins, the flock subtly meanders to and fro in the near vicinity of the coop, pecking away at the ground. The first one or two that climb the ramp don’t cause the rest to suddenly stampede inside, but once the process starts, the last one to commit is probably less than a minute behind the first. Then the fun starts on the roost, and the poop-board platform beneath it. They don’t appear to have a specific order, but something seems to matter to them because there is a lot of thumping and squawking as they jostle for position. 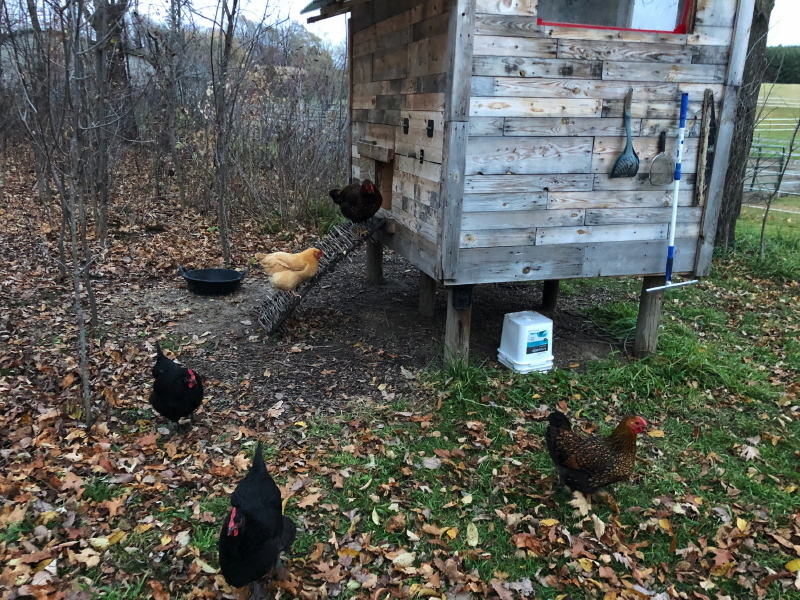 I’ve noticed it can take multiple tries to successfully move from the board up to the roost for some of the hens. Their early attempts to squeeze in tight between two other birds are often rejected. Eventually, calm settles in and the only sounds audible are some quiet contented coo-ings. When I later took Delilah for her last walk before bedtime, I brought along a powerful flashlight to check out the woods in the total darkness. Right away I spotted at least two sets of eyes reflecting the light beam back to me. I’m guessing it was deer, but they were too far away for the light to illuminate their outlines. It was just the little dots of my flashlight, reflecting back toward me. The animals stayed in place while their gaze followed us as we rounded a corner and continued on away from them. Delilah gave no indication that she noticed they were there. Her nose was frantically tracking something that must have recently wandered the path just ahead of us. There are plenty of critters roaming about lately. There are a ton of hoof-prints, and some signs a buck has been rubbing trees and scratching the ground in our woods. My morning commute in the recent darkness has produced multiple skunk sightings, a raccoon, deer, and yesterday, an opossum. I fully expect they are all including at least some of our trails on their regular nightly rounds. I just hope there are no daytime incursions into chicken territory by any of these intruders while I’m in charge. My goal is: everybody healthy and happy when Cyndie gets back in over a week. Stay tuned to find out how my luck holds out.